The quality of these inspections hangs on the capabilities of the inspectors. So who’s inspecting, what do they know about the world of SEND, and what do they bring to the table? There’s very little out there in the public domain. I’ve been investigating, with the help of a few parents. At best, it’s a mixed bag. At worst, there is cause for serious concern. Each local area is inspected by a team of three people: a serving Ofsted education HMI (Her Majesty’s Inspector) who leads the inspection team; an CQC inspector to cover the health side; and an ‘Ofsted Inspector’ – someone contracted in by Ofsted specifically to support these inspections. Although I don’t have much information yet on the CQC side of this arrangement, I’ve managed to get some information from Ofsted on the HMIs and the seconded ‘Ofsted Inspectors’. Ofsted have selected 25 HMIs to lead the local area SEND inspections. Most of them both have a substantial specialism and a successful track record in SEND - as former leaders of specialist SEND provision, special school teachers, behaviour strategy specialists, or mainstream inclusion leads. Also read: Ofsted/CQC Inspections and parents: More than a feeling? This is a group of lead inspectors who know what it takes to deliver SEND provision properly, across a wide variety of specialisms and sectors, and many have a successful track record in doing just that. Ofsted deserve plaudits for this. However, expertise in delivering provision at the coal-face is just one element of what’s needed for these SEND inspections to work well. The inspection teams also need to have a good grip of reformed SEND law, and a strong understanding of what constitutes lawful and effective practice under the new system. And this is where things start to look less robust, from a parental point of view”. The contracted Ofsted Inspectors have been brought in to underpin the local SEND inspection teams as system experts. This isn’t a new thing for Ofsted – they contract in serving head teachers to serve as OIs for school inspections, for example, and it seems to work well. Ofsted picked 29 OIs for the local area SEND inspections. Twenty-seven of their chosen OIs work for local authority children’s services – almost all in SEND, mostly at a senior level. Ofsted specifically sought to recruit people with this professional background [Read the job description and initial sift criteria here]. Last year, I asked Ofsted for a list of the OIs they had recruited, and a separate aggregated list of the local authorities that had freed up senior staff for the job. Ofsted provided the OI list, but refused to supply the LA list. Nonetheless, with some background research it was possible to identify the home LA for almost all of them. Parents frequently report that dysfunctional and unlawful working practices and culture are present in the LA SEN departments that they work with. The Department for Education itself has called out local authority culture as something that has to change if the SEND reforms are to be successful. And yet, LA SEN managers are being brought into the heart of the inspection process – at £335 per day. Ofsted have brought these LA managers to help inspect how well local areas are implementing the SEND reforms. But can their home LAs actually demonstrate a decent track record of implementing the SEND reforms themselves? We checked. In most cases, the answer is a resounding no. The first thing we did was check how many came from LA Children’s Services that Ofsted have rated as ‘Outstanding’ or ‘Good’ for social care. However, Ofsted have not stuck to this principle for the local area SEND inspections. At least 10 of the OIs that Ofsted recruited came from LA children’s services that were rated lower than Good by Ofsted. Two even came from services that Ofsted rated as Inadequate. Not a good start. We then looked at one of Ofsted’s sift criteria – a minimum of five years of successful experience in the sector. How many of their selected inspectors met this one? Using data from the Department for Education, we checked how many of the selected managers come from LAs that finalised all their regular EHCPs within the statutory 20-week deadline in 2015 (the most recent published data). This is just one yardstick – it doesn’t tell you anything about EHCP quality, for example – but it’s an important one. The findings here were grim. We found just three of Ofsted’s chosen inspectors came from LAs that managed to complete all their EHCP assessments on time in 2015. You read that right. Three. Most come from LAs who failed to get even half of their EHCP assessments done on time in 2015. One comes from an LA that didn’t even manage to complete a single EHCP assessment within the statutory time limit. Disheartened, we tried another yardstick: finalisation of statements & EHCPs for children transferring from primary school to secondary school. Under both the old and the new SEND law, these documents have to be finalised by 15th February each year, to give plenty of time for a smooth transition to secondary school. This is a long-standing and well-understood statutory duty for every LA SEN manager. Arguably, it is one of their most important duties. And the track record here was even worse. Based on FOI data, only two of the chosen inspectors come from an LA that managed to get all of these phase transfer cases finalised on time in 2016. And one comes from an LA that didn’t manage to get any of its secondary transfer cases finalised by the statutory deadline. Not a single one – for a legal duty that has been in place for over 20 years. Not good. And worse is to come. Our investigations also threw up an even more concerning set of data. Several of the OIs that Ofsted recruited come from LAs that, until very recently, have been enthusiastic users of a now-notorious specialist legal firm - Baker Small. Baker Small’s modus operandi is well-known throughout the world of SEND; if you’ve managed to make it this far through this blog, chances are you’ll already be very familiar with it. If you’re not, then this June article from The Guardian offers eloquent, damning testimony – not just on Baker Small’s practices, but also on the local authority culture that drives demand for them. Our own post on this caused a stir as well. That’s reassuring, because with values like that, there’s no way that Ofsted would employ inspectors who use the services of a firm like Baker Small in their day jobs, right? Here, it’s important to remember exactly who Ofsted were looking to pick for these inspection roles: strategic & operational heads of LA SEN services. Leaders like this don’t have the bureaucratic muscle to protect their service from the full force of austerity – but they are not powerless bystanders. Managers at this level almost certainly make and take decisions on how LAs legally conduct themselves at Tribunal. Some of them chose this route. And some of them were recruited for local area SEND inspection duties by Ofsted. 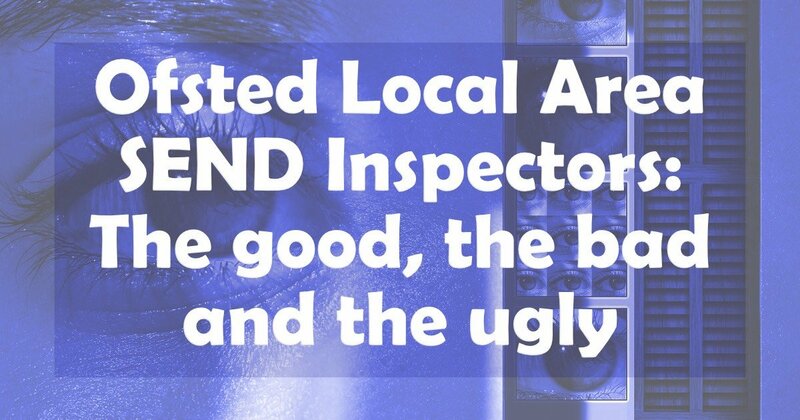 So what does all this mean for local area SEND inspections? On the one hand, most of these inspections will be led by in-house Ofsted HMIs who have experience in leading SEND provision, and leading it well. This is a great thing. On the other hand, Ofsted’s decision to use contracted inspectors from LAs is, for the most part, a poor one. A few of them have a respectable recent track record of service delivery. Most do not. The whole point of these inspections is to check how well local areas are implementing the 2014 SEND reforms. Ofsted deliberately recruited LA managers to support them in this task – as experts. But most of the people that Ofsted have recruited come from home LAs that are failing to implement these reforms effectively. Some of them are failing spectacularly. And worse still, some have taken procurement decisions that are diametrically opposed to the interests of children with SEND. The whole purpose of these local area SEND inspections is to see whether legal reforms are being implemented well. And the word ‘legal’ is crucial here. There is no floor standard for implementation. This is the law. This is statutory duty. I really don’t know why this has happened. The most likely explanation is that we are simply looking at an initial failure of due diligence. Ofsted have not yet ‘signed off’ every one of these contracted inspectors for duty; we can only hope that they are looking harder, and looking wider, for inspection expertise. In other areas – school inspections, for example - Ofsted have certainly been willing to re-examine their pool of contracted inspectors and take action. Another, less enticing prospect is that Ofsted decided that the stringent criteria they use for contracted school inspectors simply aren’t necessary for contracted SEND inspectors. I hope that isn’t the case. If it is, then I would be lost for words. The people whose lives are touched by local area SEND services desperately need accountability, and they need accountability to have impact. That’s one of the things that the local area SEND inspection process is supposed to address. But one of the main reasons that we all need accountability so desperately is the type of organisational culture that’s in place in too many local authorities. That culture has been brought into the inspection set-up. And that’s worrying. Will more cash guide the battered ship of SEND reform to calmer seas? Why is this no surprise? Another element of sham in the mirage of provision!! Well, ‘you scratch my back I’ll scratch yours’ springs to mind. Coming from an LA area that received a glowing outcoming which was ‘praised’ in the local press, I can tell you this is a sham. Our LA is one, that through the grapevine someone in the know stated that every time a parent loses an appeal for a statement, a cheer goes up round the SEN department. Our family has suffered appalling failings from the SEN department which have had a huge impact on our own children’s education and wellbeing. It is very apparent from their attitude that they don’t give a damn about the children, see parents as the enemy and will do everything in their power to obstruct, break the law and even retribution against parents. Yes, we’ve had retribution, recrimination and lies. Very sad that the LA hasn’t the capability to do things by the book. Interesting and informative as ever, thanks Matt. Comes as no surprise to see Gloucestershire waving the flag for duplicity: Not only are they still using BS for existing cases (at least) but they also employ ‘Independent SEN experts’ on a consultancy basis to investigate SEN complaints who say silly things like (and I loosely quote) ‘the LA was not at fault for not providing SSEN provision as it provided the money to the school’; and the outgoing Head of Education was recently quoted in the local press as saying that in the local inspection, Ofsted had described the LA as having outstanding SEN provision. Not quite my take on the Ofsted report. I do wonder why so much public money is being spent so badly. Thank you for a really interesting and well researched article. Sadly being Ofsted rated good or outstanding for children’s services is not necessarily a reliable guide to how well a LA is delivering on SEND. Expected Ofsted inspections tend to promote a flurry of activity in a LA with specially designated manager(s) ensuring staff are briefed and everything is “ofsted-ready”. A LA which is rated outstanding is rightly proud of this and seeks to maintain its rating. If the SEND department is having problems in meeting its statutory responsibilities it might be thought that the LA would be aware that this was an Achilles heel and would seek to amend its practice accordingly. Instead, one of which I am aware told staff that it didn’t have to worry much any more about Ofsted inspection of SEND provision as the SEND department lead was now an Ofsted Inspector and the LA would be able to exercise new freedoms under clause 29 of the Children and Social Work Bill to opt out of some of their legal obligations (though the Lords subsequently put paid to this for the time being in November). I too am concerned that the organisational culture in some LAs is being imported into the SEND inspections and thereby damaging the possibility of developing true accountability. I see Gloucestershire is included in the table of SEND Inspector areas. As this LA was recently criticised by an Upper Tribunal Judge for misunderstanding their duties towards young people over compulsory school age, and the LA is still using BS, one can hardly feel confident in any inspection a Gloucestershire seconded Ofsted Inspector may be involved in. Any update available re Ofsted’s request for a right of reply? Nothing to report, I’m afraid. Ofsted asked for a right of reply, SNJ agreed, but as yet Ofsted have not replied. The offer remains open.